The doctrine of the Immaculate Conception was proclaimed by Pius IV in 1854. The title of "Nuestra Señora De La Concepción Inmaculada" may be properly assigned to a variety of Marian figures. These all refer to the purity of Mary, although they may appear in a milieu of different poses and allegories. 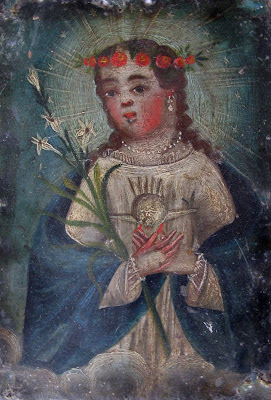 Our Lady of the Immaculate Conception is shown here…as a young girl with a crown of roses, with her hands crossed over her heart, holding a dove, the symbol of the Holy Spirit, and staffs of roses and lilies to her chest, which represent her purity. She has a halo of stars around her head and clouds framing her.